“The fiscal terms in the current draft of the Petroleum Industry Bill (PIB) are not only the “harshest”, but the “most uncompetitive in the world”, oil and gas operators in Nigeria have said. 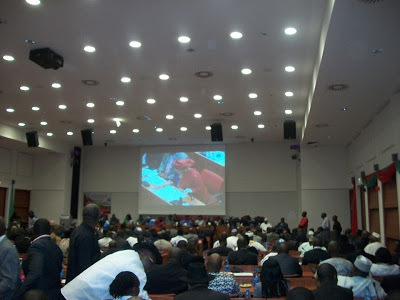 At the senatejoint committee-led public hearing on the PIB held last Thursday in Abuja, Federal Capital Territory (FCT), representatives of the oil majors, including indigenous oil companies advanced an array of reasons for their mounting opposition to the Bill. Under the platform of the Oil Producers Trade Section (OPTS) which represents about 18 international and indigenous oil companies in Nigeria, both foreign and local operators are ostensibly united in their sharp criticism of the proposed oil regime. The OPTS representative told the Nigerian parliament that the body (OPTS) supports the Bill’s objectives to create a conducive business environment for petroleum operations; and to enhance exploration and exploitation of petroleum resources in Nigeria. However, the Bill as currently drafted will not deliver these objectives. As more and more countries are opening their boundaries for exploration and production, what Nigeria needs is an investment friendly and business conducive environment. Given the scale and magnitude of reforms, Nigeria cannot afford to get things wrong. The global oil industry is expanding and the introduction of new drilling technologies has made the industry even more competitive. The discovery of shale oil is positioning America to be the next export destination in no time. All the countries with rich shale oil deposits have been in the public eye in recent times, and they are all in competition with Nigeria for investment drive. First off, the current fiscal terms in the PIB will make it difficult for Nigeria to attract investments and be globally competitive. High royalties, taxes and levies in the current Bill are so harsh that Nigeria will have the harshest oil regime in the world. This will further make future investments uneconomic. The PIB proposes 18 and 26 per cent royalties; 55 per cent tax rate and 20 to 75per cent government’s share of profit oil leaving only $0.34 per barrel of oil as incentives to the oil producers. Under these terms, production will fall by as much as 25% by 2022. This is contrary to the current plans to add up to 1.5 million barrels to production levels during the same period. Lack of domestic gas infrastructure: Gas requires interconnected transportation systems, including extensive transmission and distribution systems before it gets to the consumer. These are lacking. As the holder of the 9th largest deposit gas reserves in the world, why hasn’t full scale gas production taken off in Nigeria? There are two main reasons for this: 1) low gas price; and 2.) lack of infrastructure. Gas sector in Nigeria is still very much in its infancy. PIB makes matters worse by increasing gas tax by 25%. Incentive-based approach is required to jumpstart the gas revolution. In terms of Joint Venture (JV) Funding, the Nigerian National Petroleum Company (NNPC) is a partner in 50-60% ownership of production with oil companies. JV funding provides the single largest source of income to the country. Under the new reform bill, the National Oil Company (NOC) will enter into Joint Venture relationships with oil companies. OPTS argues that the proposed JV institutional structures will not help revolutionize the industry, doubts persist whether the NOC will contribute its 50% of the funding. The grant of licenses/leases is another contentious issue IOCs worry about. The main concern here is that the PIB does not provide for the frequency of bid rounds – or when they will take place. OPTS however recommended that licensing rounds should take place every two years. The other unease about the PIB has to do with sanctity of contracts. This simply means honouring existing contracts which is crucial to boosting investor confidence. PIB does not preserve existing contracts. Although all governments have sovereign rights to change their laws at any time, it is equally important to respect existing production sharing contracts as this will guarantee business certainty and investment confidence in the sector. The international oil companies particularly SHELL, Mobil, Chevron, AGIP, TOTAL and Pan Ocean Oil fully backed OPTS’s concerns and recommendations listed above. The oil majors however made separate presentations highlighting particular aspects of the Bill they want addressed. SHELL’s Commercial director, and Upstream for Africa reiterated that NNPC has been unable to contribute its own 55% percent of JV Funding for many years. And NNPC’s signature inability to meet its financial obligation is worrisome. CHEVRON and SHELL recommended that the PIB must address NNPC’s lingering unpaid share of JV funding. The Bill further penalizes oil producers for non-production of gas even when production is not economically viable. Unviability of gas production is compounded by the low domestic gas price which discourages investment in the sector. Countries like Indonesia, India etc have high gas prices of $24 per barrel which is currently different from $6 per barrel obtained in Nigeria. To deliver gas for power and development, there should be reform of institutions, far more efficient contract and approval systems and the development of competitive fiscal regimes. The quantity determination of crude oil and petroleum products is another issue attracting intense criticism. The Department of Petroleum Resources (DPR) is responsible for the quantity measurement of crude oil and petroleum products. Contrary to popular belief that the information regarding the amount of oil extracted and produced in Nigeria is unavailable, SHELL insists that crude oil production is well-measured across the Niger Delta. Measurement takes place at three points: 1.) the well head; 2.) flow station; and 3) Crude oil tank fiscalization is again carried out at the export terminals. At this stage, water is separated from crude and the tank content is allowed to settle for the minimum period specified for that type of crude oil or product. DPR is physically present at the 275 flow stations and 5 export terminals to measure and document the quantity of crude oil (volume, and weight) produced and exported. However, it is impossible to have very accurate data of production levels because Nigeria does not have the technology to undertake that task. Due in large part to the high cost of fiscal metering, this should be done at the export terminals. In other countries, the measurement is undertaken by one agency unlike in Nigeria where too many agencies are involved, with attendant high costs. SHELL recommends that the measurement or quantity determination of crude oil should be done at the fiscal sales point. MOBIL: Exxon has a long history of investment operations in Nigeria having started deepwater projects since 1993. The company plans to invest over 30 billion dollars in Nigeria, but the PIB provisions as currently framed are hurting those intentions. MOBIL’s does not want the PIB to be applied retroactively. Reinforcing OPTS’s position regarding the sanctity of existing contracts, the oil giant urged the Nigerian government to respect the terms of subsisting production sharing contracts, while new contracts will be subjected to the new regulations. TOTAL: TOTAL is very concerned about dry gas also known as non-associated gas which is not derived from oil. PIB does not allow oil companies to undertake production of dry gas notwithstanding that much of Nigeria’s gas is dry gas. This, position, in its view, has grave implications on the domestic power generation capacities and economic development. CHEVRON is very concerned about lease duration and deepwater projects which currently comprise 30% of government revenues. Lengthening the duration of oil licences and leases topped the oil major’s list of recommendations. CHEVRON claims it has made huge investments in gas production based on 1993 contract terms which were then attractive and investment competitive. Potentially, the fiscal terms in the PIB will change all that, as they are the most onerous in the world. On gas investment, CHEVRON says it has reduced gas flaring by 70% and currently produces about 40% of the gas sold in domestic market. Increasing gas taxes from 30% to 80% makes further investment in gas uneconomic. Aligning with the position of other major IOCs, CHEVRON reiterates that low gas price is making the sector unviable. And again, a realistic timetable is needed for achieving the domestic gas supply obligations (DGSO) set out in Bill. There is also the issue of uncertainty in the transition period when the sector will be deregulated. As with CHEVRON, Pan Ocean Oilhas two major concerns with the PIB: the fiscals and gas. Although the company pledged its full support for the Niger Gas Masterplan, the PIB provisions will threaten the achievement of the objectives laid out in the Master plan. The increase of gas tax, they restated, will make the gas sector uncompetitive. AGIP: AGIP’s major concern is that the PIB does not clearly define where the oil measuring points are. Apparently, AGIP supports SHELL’s recommendation that the measuring of crude oil and products should be done at the sales points. Expanding access to fair, speedy and independent dispute resolution mechanisms is very important to AGIP. Currently, the state high courts reserve the jurisdiction to resolve disputes. But considering the huge volume of investments involved, an independent judicial mechanism that can effectively and expeditiously settle disputes, especially where such disputes may involve a regulator, is imperative. The Petroleum Technology Association of Nigeria (PETAN) posits that S. 267 – 268 which criminalizes and penalizes gas flaring did not adequately take into consideration the state of gas infrastructure in Nigeria. The Independent Petroleum Marketers Association of Nigeria (IPMAN) asked for a pipeline safety and maintenance agency. There are currently too many agencies regulating the industry with each imposing its own levies and taxes. This further increases operational costs for oil companies.